A Texas good Samaritan stepped up and foot the bill for a woman’s medically necessary surgery, which was not covered by Medicare — to the tune of around $4,000. 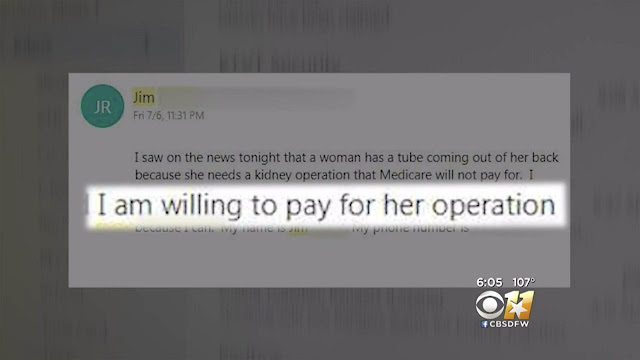 North Texas resident Amy Boykin was in dire need for the second half of her medical procedure, according to KTVT-TV, but because Medicare would only pay for inpatient surgeries — this procedure was outpatient. As a result, Boykin found herself unable to receive the care that she needed to complete the procedure. According to KTVT, doctors installed a tube in Boykin’s kidney, which protruded out from her back, in order to relieve pressure on her kidney as an apparent result of a stone. Boykin was told that the doctors would remove the tube a few days later, but was shocked when she found out that the hospital would be doing the procedure as an outpatient — because her insurance, Medicare A, pays the full amount only for inpatient hospital procedures and stays. Because of the staggering cost of removing the tube, Boykin was not able to have the procedure and as a result, sustained two infections in a six-week period that were related to her kidney intubation. Several weeks ago, Boykin set up a crowdfunding page to raise money for her medical expenses. At the time of this writing, Boykin has been able to raise over $2,800 of her $2,500 goal. KTVT aired footage of an interview with Boykin, and showcased her kidney tube — an apparatus that had taken its place as a daily part of her life since June. After footage of the interview made its rounds, a retired widower by the name of Jim got to thinking that he should do something to help. “I had the option of being able to do something about it, so I did,” Jim said, and ended up footing the bill for the entire procedure, which cost about $4,000. Boykin successfully underwent the procedure to remove the tube from her back, and has said that she can scarcely express the gratitude she feels for her own personal good Samaritan. “I had to meet him … it would be an honor to shake his hand,” Boykin said. Boykin was able to meet Jim after the procedure, when he came to visit her during her recovery. “There really aren’t words for what he’s done for me,” Boykin explained. According to KTVT, Boykin says she plans to use the money from her crowdfunding page to pay the rest of her related medical bills and current living expenses until she’s fully recovered.